A bit late, due to holidays, but too good not to report. I saw the guitar legend and his band the 4th dimension at Ronnie Scott’s in London last month. Probably the most expensive tickets I have ever bought, but to be 10 feet from McLaughlin and the rest of the band … why not? I won’t bother to try to describe his playing, you can find samples on youtube, but to give an idea, it was in the groove of a) his own music (of course) – louder and tighter than ever, b) reminiscent of Jeff Beck / Jan Hammer in the 80s and c) some sensibilities of Jan Akkerman, the great Dutch Jazz guitarist. 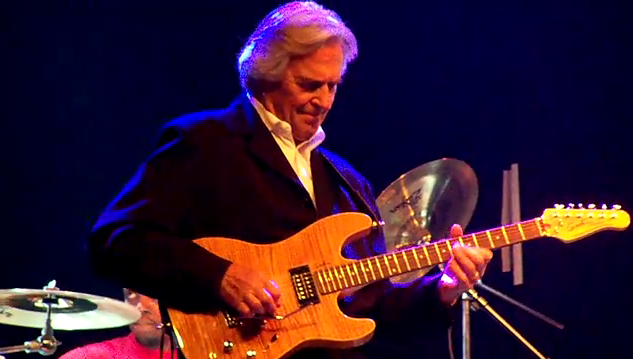 McLaughlin goes further and harder than you expect – he plays great jazz lines over hard syncopated rock rhythms. Gary Husband played keyboards, and as ever, is a great personality in stage. You never know quite what he is going to do. This gig, he left the keyboard for a while and went head to head in a drum duel with Ranjit Barot for around 10 minutes. The presence of two complete drumkits on the stage was a warning that something amusing was likely to happen. It was like the ‘cuttin’ heads’ scene in the Crossroads movie, but with humour. Translated into words… Barot: I’m the real guy here, cop this… Husband: wimp. Take this. Barot: just getting my overcoat off here. Whack! Husband: that sucked, eat my sticks! Barot: off my stage, pretender! …. you get the idea. Etienne Mbappe on bass was just a joy to listen to (especially for me, he was 3 feet away), punching out hard rhythms, lots of slap and melody. Summary: a bunch of world class musicians + 1 legend in London’s most famous jazz club = perfection. This entry was posted in Culture, Guitar files and tagged gig review, guitarists by wolandscat. Bookmark the permalink. I saw the John McLaughlin trio in Brisbane in 1990(?) Trilok Gurtu on percussion and Kai Echkardt on bass. Just the fact I can remember the names of John’s band members speaks volumes for how much this concert impressed me. I still have the concert T-shirt, which I bring out only to wear at other concerts, where I might get the odd nod of head amongst the cognoscenti.